It's the last Monday of the month which means it's time for my Secret Recipe Club post. This month I was assigned Fantastical Sharing of Recipes written by our group leader Sarah. Sarah is a recipe hoarder and her blog is a way to share all the great recipes she finds as well as a way to get through the recipes she has hoarded. She lives in Tennessee with her husband, three adorable kids and two cats. She has a great feature on her blog called "Throwback Thursday: Rediscovering Old Favourites in the Recipe Archive". I think it's a great way to share with readers and to remind ourselves of some of the older recipes on a blog. I also love how Sarah shares her Menu Plan each week. It's something I always want to get on board with but never get around to. Sarah has a huge number of recipes which made it difficult to pick one. I settled on this Starbucks Copycat Quinoa Black Bean Burritos because I'm always looking for new ways to eat quinoa. I've never had the Starbucks version but I have had their Tuna Thai wrap and really liked that. This recipe was very easy to put together. I baked them as Sarah directed and I've also used my George Foreman Grill. Both ways turned out great but I prefer the way Sarah makes them by baking them in the oven. When using the grill, the wraps get flattened although it is faster since I don't have to heat up the oven. The oven method takes longer but I preferred how the tortilla cooked in the oven. On my list of to try recipes are Southwest Tuna Salad Sandwiches, Cheeseburger Rings, French Bread Rolls and Cincinnati Chilli. Please head over to Sarah's blog to check out some more great recipes. You can also see what everyone else made by scrolling to the bottom of this post. To a pot, add quinoa, water, paprika, chilli powder, onion powder and garlic powder. Bring to a boil over medium heat. Reduce heat to medium-low, cover and cook for 15-20 minutes. Fluff with fork. Add lime juice, black beans, corn, red chilli flakes and salt. Mix. Preheat oven to 350°F. Line a baking sheet with foil or parchment paper. Spread some mayonnaise on a tortilla. Sprinkle on a little bit of grated cheese. Add some quinoa and roll up. Place seam side down on the prepared baking sheet. Spray with olive oil. Bake for about 10 minutes or until golden. Being a non-coffee drinker I had no idea starbucks even served such things as this! Sounds delicious. How nice that you got Sarah's blog! I had her a couple of years ago, it was fun, even though of course it is not a surprise for her... but it makes us want to go the extra mile and make a nice post about it, which you did! Hmmm, interesting twist adding mayo to the burrito. I wouldn't have thought of that. Great choice this month. 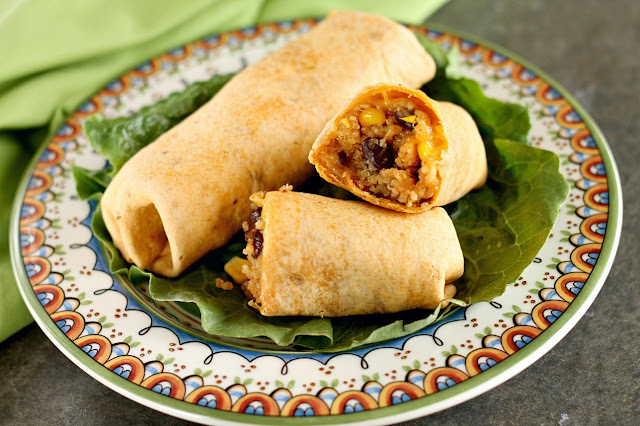 what a GREAT idea to put quinoa in a tortilla wrap! Don't you love Sarah's blog? So many great recipes! These look delicious! I had no idea Starbucks had these! Great photos! I had no idea Starbucks had real non-breakfasty food! I always have quinoa but never do anything with it. Love the idea of putting it in a burrito instead of rice. And I always prefer my burritos baked anyway. I was thinking the same thing...I haven't seen a quinoa wrap at starbucks before. Of course I am normally there in the morning jumping to get my coffee fix. The burrito looks delicious though. Happy Belated Reveal Day! You guys are lucky that your Starbucks' have these amazing entrees! Ours have coffee (obviously, lol), and a selection of pastries.